Summary: The scientific activity of the group is focused in the study of ecology, the population dynamics and the cultural changes which characterize the Neanderthals and modern human the Prehistory societies from the beginning of the Neanderthal behavior, to the emergence of the first agricultural and herder societies. This study is carried out from a multidisciplinary approach, integrating different disciplines: lithic technology, zooarcheology and taphonomy, paleontology, dental micro-wear, biogeochemistry, archeobotany, spatial analysis and archeostratigraphy, study of the behavior of symbolic and computational modelling. Among the objectives that are studied by the group are the following: a) the definition of Neanderthal behavior as a well defined position in human evolution; b) cultural changes related to the arrival of modern humans into Europe; and c) the ending of hunter-gatherer's societies and the emergence of producer economies. Objectives and research lines: The research group is aimed at studying the cultural and behavioral changes, the ecology and population dynamics of Neanderthals and modern humans from the final Middle Pleistocene to the early Holocene. During this period, three major processes took place: 1) the origin of Neanderthal behavior; 2) the Middle to Upper Paleolithic transition and 3) the beginning of a productive economy. Our 6 main strategic objectives encompassing the specific challenges are inter-linked with other ongoing projects leaded or participated by the members' Group. 1a.The variability of Middle Paleolithic technologies, focusing on the alternation between expedient and planned behaviors. 1b.The formation processes of lithic assemblages through the analysis of provisioning strategies, spatial distribution of technical activities, intra-site artifact transport and recycling. 1c.The typological and technological ruptures at the Pleistocene-Holocene boundary. 1d.The importance of expedient technologies in Upper Paleolithic and Mesolithic assemblages. 1e.The fire and wood technologies related to wooden tools, structuring of living floors and energy resources (fuel). 1f.The formal symbolic expressions and execution techniques by hunter-gatherers and farmers herders setting out graphical and symbolic process as a socialization issue. This includes the study of cave and mobile art from the Upper Paleolithic to the Neolithic, and other evidence of symbolic behavior such as personal adornments. For this, we apply different methodologies: morphotechnical stone tool analyses, refitting, 3D digitization of artifacts, raw materials analytical characterization (X-Ray Diffraction, Ramanspectroscopy and geochemistry), GIS and archeobotany. 2a.The evolution of survival strategies of prehistoric groups through the meat diet with specialattention to cultural change periods. 2b. Contribution to the population dynamics from the traditions observed on animals processing patterns (same groups with a strong territoriality vs. different groups with high mobility). 2c. Seasonality of human occupations using tooth microwear and dental cementum incremental analyses. 2d. Hominid-carnivore interactions and other co-evolutionary processes. i) Neo-taphonomy and taphonomic characterization of the wild carnivores (equifinality processes). ii) The role played by the carnivores in the archeological assemblages. 2e. Animal domestication processes and early husbandry based on the integration of biogeochemical analyses. 2f. Uses of plants in human activities as human and animal food (fodder), as well as in combustion structures related to the subsistence and socio-economy. The methodology is based on zooarcheology and taphonomy, tooth microwear studies, experimental archeology, faunal Stable Isotope Analyses (δ13C and δ18O), and phytoliths and calcic oxalates analyses. 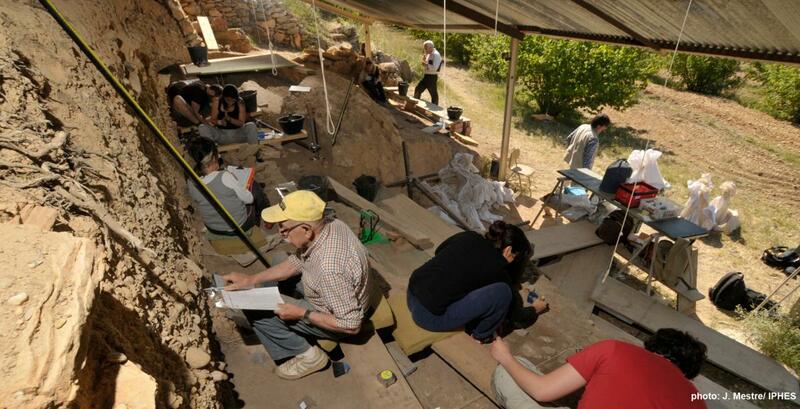 3a.The characterization of activity areas and household spaces from the Middle Paleolithic to the Mesolithic. 3b.The identification of high temporal resolution units in archeological sites. 3c.The understanding of occupation patterns with special attention to the comparison between residential sites and specialized contexts and throughout lithic and zooarcheological records. For this we will integrate the elements of analysis applying kernel density-based 'relative risk'surfaces and point process models to explore and test hypotheses relating to anthropic intra-site spatial distributions. 4. Paleoenvironment. Climate changes had a significant impact on plant and animal populations and, consequently, on the human adaptive patterns. 4a. Changes in vegetation analyzing high resolution climatic fluctuations with the quantification of the impacts of human activity: landscape and cultural changes. 4b. Socio-ecological resilience to environmental changes from the Late Glacial to the Mid-Holocene in the Iberian Mediterranean area. Paleoecological reconstructions of the Pleistocene-Holocene transition are based on the analysis of anthropic and natural deposits (drills in ancient lakes). 4c.The formation of deposits through the study of non-pollen palynomorphs (NPP) and plantelements in fossil dung. 4d. Human occupations at local geographic scale and short timescale, compared to regional and long temporal scale. For this we will apply an integration of different proxies, archeobotanical (charcoals, pollen,phytoliths, and natural deposits) and microvertebrate’s paleontological studies. 5a.Using mathematical modelling to better understand the co-evolution of gene-culture-ecosystem (Niche Construction Theory). 5b.Applying human dispersal modelling and analysis of demographic proxies to study cultural drifts and regional population dynamics. 5c.Conducting computational experiments (based on the combination of social networks analysis and agent-based modelling) to study processes of regionalization and cultural fragmentation. 6a.Expanding the radiocarbon dataset with new dates and Bayesian models to get a more precise an accurate chronology, produce summed probability distributions and simulated radiocarbon datasets. 6b.Radiocarbon dating of sites from the Late Middle Paleolithic and Early Upper Paleolithic. 6c.Obtaining indirect 14C dating of parietal paintings from the calcium oxalate related to the pigments and coatings through its micro-stratigraphy.